Quansoo is a private beach, natural and undeveloped, with high dunes and crashing surf. Though beautiful, it is not usually interesting to photograph, just sand and water in pretty much the same proportion a far as you can see. On this day, I walked behind the dunes through a fairly dry marsh, and saw these reeds just across a tidal creek. 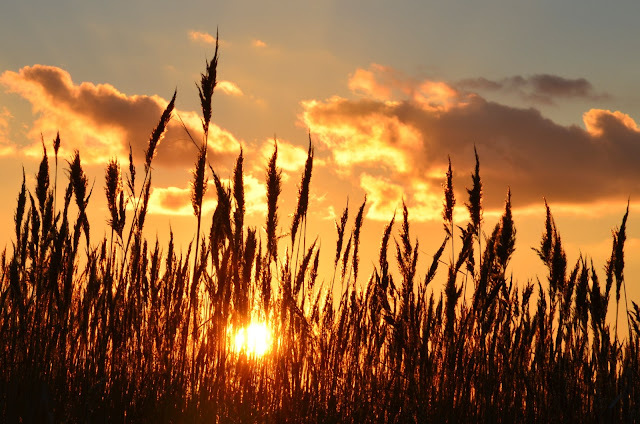 The reeds block enough light so the sun doesn't blast out the image, and captured the golden glow perfectly. Purchase this photograph (Or at least see what it looks like as a notecard).